Physical beauty is a tremendously important attribute to have as a woman in China. It is important when being evaluated for your potential worth before having accomplished anything, and also for being evaluated as more important than accomplishments or actions that have been already performed or done. Cosmetics play a key role in the beautification of women in China, and Chinese women are proud of their skill in using cosmetics to change their appearances. Coupled with specific behaviors and mannerisms, Chinese women use cosmetics to look younger: eyes are enhanced to appear larger (both outside the eye and within), skin is made smoother, lips are made to pucker and pout. The ideal of youth is attractive to everyone and is widely used as a commercial incentive. Using youth as a standard of beauty has then raised the qualifications of being beautiful to involve younger and younger people, as recently seen with Hoang Bao Tran Le. As the standard of beauty becomes younger, the importance of one’s skill in applying cosmetics to achieve the semblance of youth has ultimately led to this point: a young-looking “twelve year-old” child applies make-up that mature women put on in order to look younger. Have you ever seen a twelve year-old girl wearing make-up that has been professionally applied? Truly very shocking! Only until you’ve sen these photographs will you dare to believe that a 12-year-old girl could possess such divine power~~! 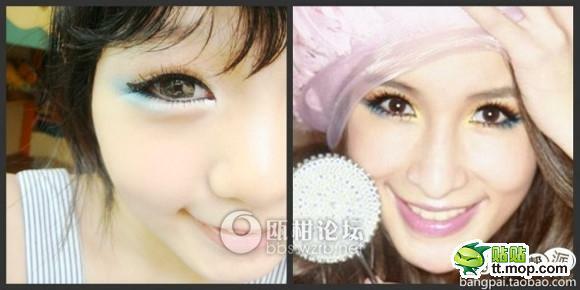 An Elva Hsiao-like diamond candied visage~~! Indeed, a display of professional skill~~! It is undeniable~~! No matter what, she is still just a primary school student, right? So everyone don’t get too excited~~! After all, she is still just a little child~~~! Only thing is, I am a bit concerned for her skin in the future~~~! I’m going to try asking you guys a question: let’s say all day your child went out with make-up like this, what would you do? Leaving aside for the moment the issue of whether or not the cosmetics are genuine, and even if they were, one can imagine that skin that has been messing around with makeup since the age of 12 would probably end up looking like 40 by the age of 25~~! I hope God will bless her! She begins by applying something to her face~~! Uh… with cosmetics there are no ugly women. Such a young age and already so flirty/precocious… there are too many flirty cunts these days. Beauties are made this way. Her family is probably involved in cosmetology or cosmetics, [so] it’s hereditary [meaning she is using makeup at a young age because of family environment/influence]. Monsters are getting younger and younger. Is she going to [look] old by the time she is middle-aged? Is this what passes for a beauty/beautiful girl? In the eighth picture, her armpit still has a hair in it; messy…. OMG, I’m 23-years-old this year and I still can’t put on make-up as well as her!!! 12-years-old… I better just pass by, and not comment. 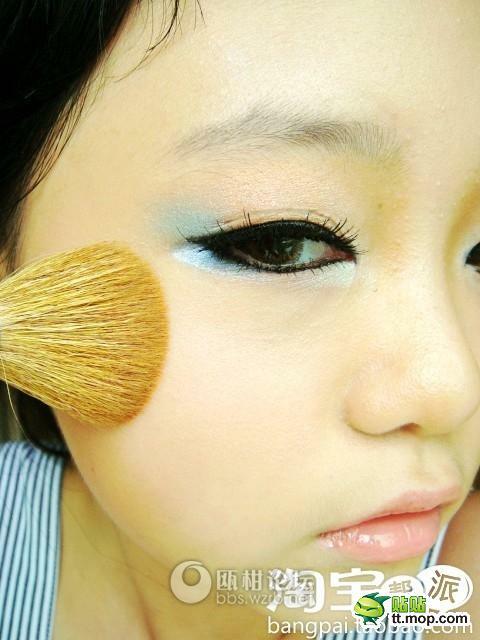 It’s a good thing, she can be a cosmetician in the future, [she’s] really talented. I feel that this post isn’t real because we never get to see the little girl apply the make-up with her own hand, and there are no wider shots [photos taken from further away]. They are all close-ups! These pictures don’t show the truth! Too cute, the type I like. Fei zhu liu influence is tremendous.. I don’t know how to put on make-up. This child looks really ugly. No matter how much make-up you use, the childlike-ness of your face cannot be hidden. Children’s skin is normally very tender/delicate. If you start using makeup products too early, you won’t be able to leave the house in the future [because you will look too ugly due to long-term effects on skin]. Certain things are reserved for certain ages in one’s life. Child, are you not afraid of your skin prematurely aging? Once she reaches 20 years of age, will she still be able to show her face without wearing makeup? 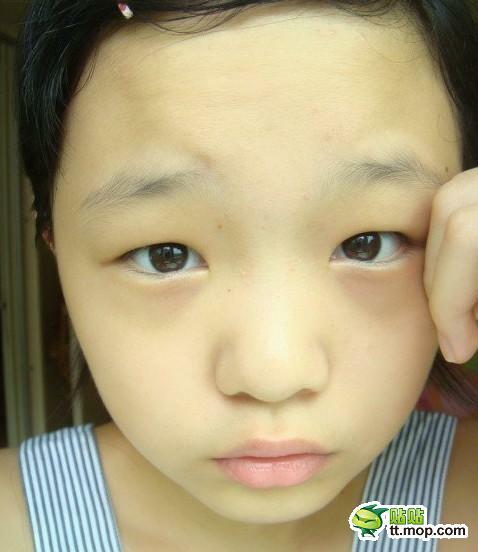 Only 12-years-old and she already has small wrinkles under her eyes…. Ai!!! Just two days ago I was talking with my friend wondering how come there are more and more beautiful girls these days, whereas there haven’t been an increase in handsome guys. Apparently this is the reason why there are more beautiful girls!!! Is 12-years-old too young to begin using makeup and cosmetic products? Check their ID first. Personals @ chinaSMACK. Terroir is a gentle soul who doesn't enjoy sunsets but does like the company of those who do. He says no to Tia Carrera, yes to Bruce Lee, and walks the thin line between the top of a still, calm lake and below it, where it looks even calmer.